50W per channel A Class, USB digital input, KT150 tubes, remote control. It has been widely thought since the 1980s, that tube technology is a thing of the past, obsolete even. However, at Jadis we are keeping this technology alive because it reproduces the best quality sound. Although tube manufacturers may be few and far between today, those left are still innovating and offering us new tubes. We received the first KT150 tubes earlier this year. Having seen their qualities and characteristics, we decided to give them a try. Enraptured by the sound quality of bass notes and the details associated with the obvious power, we decided to launch a new integrated amp, called I-50. The KT150 is incompatible with other power tubes (KT90, KT88 etc…). Therefore, the I-50 is completely unprecedented at Jadis. Specific out-put transformers are required to make the most of the KT150, hence the necessity to adapt the schema. In keeping with current trends, the I-50 is not only equipped with a volume remote control, but also a digital USB input which will allow the end user to connect directly to their computer. Whilst visually it compares to the existing simple push / pull integrated amps in the Jadis range (DA30, DA50, I-35), the I-50 combines the very best of traditional tube quality sound in its most modern form to date. 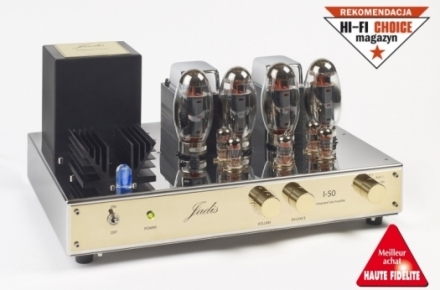 "Despite its unique design for which even the Japanese audiophile don’t get bored, this integrated amplifier carries a schematic thoughtfully developed by the Jadis team with computer connection capability. High musicality is here and will not disappoint the traditional fans of the “Jadis sound”, neither the potential new owners whom might be seduced by the reasonable asked price compared to all its qualities."